FACE TO FACE is a late night Christian talk show produced in the studios of Network Ten in Sydney. This 'best of' collection features inspiring interviews with Marina Prior, Darlene Zschech, Colin Buchanan, Ken Duncan, Ian Harper and more. 120 minutes. 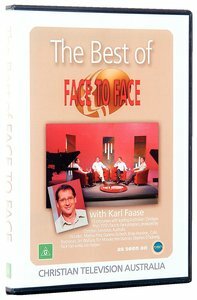 About "The Best of Face to Face"
Karl Faase is the Senior Pastor at Gymea Baptist Church in Sydney's southern suburbs and is one of the most experienced Christian radio & television presenters in Australia. His Daily Nudge radio spots are played around Australia and in the UK. Karl's television shows are regularly featured on Christian cable stations and free to air. Karl was the Executive Director of the Australian Arrow Leadership Development Program until December 2010 - a national leadership development program for emerging Christian leaders across Australia and the co-founder of the Media Project, Jesus. All about life a high profile media campaign working in conjunction with local church participation. Karl currently serves on the Australian board of BGEA and Samaritans Purse.